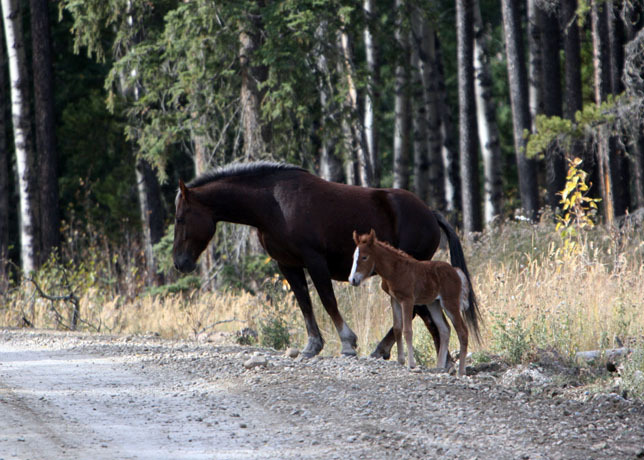 I had noted in the last post about a young foal that we had found that had been born on October 14, 2011. In its first day of life it had got into difficulty and if not for some human intervention it may have perished. I had decided to go back out this past Tuesday to check on the little filly. As I travelled into the area where I had last seen it, there was no sign of the herd it belongs to. This concerned me because when I had first seen it, the young thing was very fragile and seemed to be in difficulty. I started to travel around on some of the trails in the area looking for “Little Wonder”. 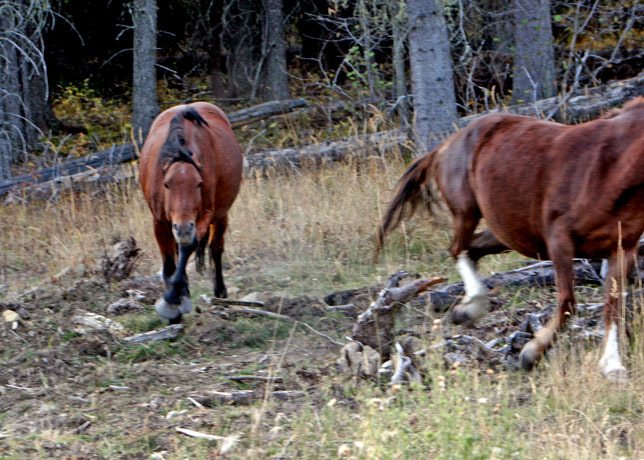 As I went up one road I saw some horses in the trees and became excited that it would be the herd I was looking for. I got out of the vehicle and started to approach on foot. 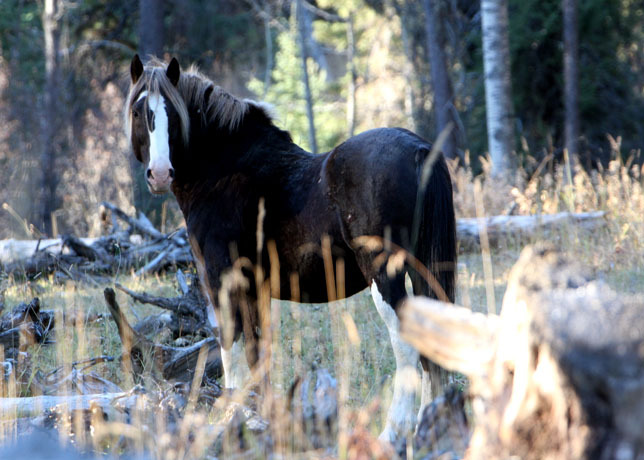 I got another big and pleasant surprise, for there feeding in this small forest glade was “Socks.” I had not seen him since he had lost his herd to a more dominant stallion, late last summer. At that time he was beaten up and in my mind looked very forlorn. He had been a favorite wild horse stallion of mine, that I loved to photograph. Upon seeing him like he was, tough old me, cried tears of sorrow for him. I had searched for him all winter and over the spring and summer of this year. I feared that he may have perished over the winter. Socks looked fine and he had another young three year old stud as his companion. As I photographed them they showed no fear of me and it seemed that he recognized me as his friend. This was a thrill for me. 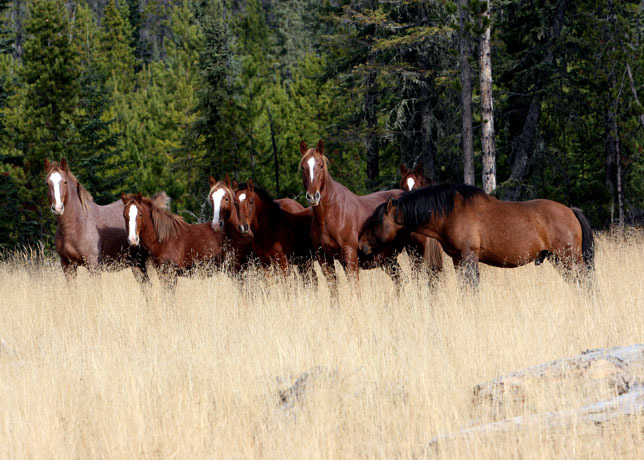 I continued to travel around the hills taking photographs of several herds of horses that I came across. The wild horses are in excellent shape. The foals, yearlings, mares and stallions all have glossy and ever thickening coats as they get ready for the winter to come. In wild horse country the grass is still tall and plentiful and thus if the winter does get as bad as some are forecasting, then most of the wild horses should survive. After a time I headed back into the area where I had last seen Little Wonder’s herd a few days before. Rounding a bend on the trail, there they were. The foal’s mother is just a young mare, but I could tell right away that she had now accepted it and had become quite protective. She started to lead it away from the human danger. The herd mare did not like this and tried to stop her. This did not bode well with the herd stallion, “Wastoh”, as he called her back. She would have none of this and whinied at the foal’s mare to come back into the herd. The stallion then allowed me another thrill then by doing what we call snaking his head and body in order to chase the rest of the herd to where Little Wonder had sought refuge. It was an end to another great day in wild horse country. Please remember our 2012 calendars are available online and we can ship anywhere in time for Christmas if ordered soon.